The Globe's top selling mobile data promo, GoSURF50 was upgraded with 1GB of mobile data allocation to further support customers’ digital lifestyle. 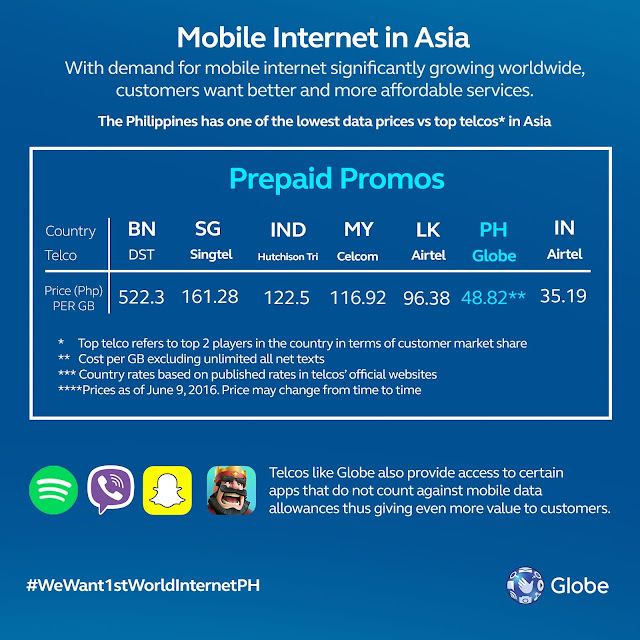 In terms of mobile data pricing, GoSURF50 is now the 2nd most competitive offer across the Asia Pacific region at only P48.82 per GB in comparison to top prepaid telco offerings in the region including Brunei, Singapore, India, Malaysia, Sri Lanka, and Indonesia. The promo offered at retail price of P50 which is valid for 3 days, it also includes unlimited texts to all networks as well as FREE Facebook. GoSURF50’s 1 GB of data gives customers 700 MB for surfing while the remaining 300 MB allocation allows access to the customer’s app of choice such as Snapchat, Viber, Spotify Basic, YouTube + Daily Motion, Clash Royale, or Clash of Clans. With 700 MB of data, one can enjoy streaming YouTube videos for 200 minutes; 600 posts and 880 likes on Facebook; 200 posts on Twitter; 100 Instagram uploads; and about 500 push emails. Globe Prepaid customers can subscribe to the new GoSURF50 and choose their free content via *143#. To check remaining MBs just send GoSURF STATUS to 8888. Customers will be notified immediately upon consuming 100% of the MB allocation. know more about the new GoSURF50 visit glbe.co/B1GGERGoSURF. For Globe Prepaid’s latest offers, visithttp://www.globe.com.ph/surf/plan/gosurf50.